It’s been roughly nine months since I successfully defended my PhD thesis, and since then I’ve moved on to a new job, so I didn’t expect graduation day to be a big deal. I would put on the colourful robes, walk onto the stage to shake someone’s hand and collect my certificate – job done – but the day turned out to be a wonderful celebration of four great years of physics research with Manchester! The year I started my PhD in the Particle Physics group in Manchester was a bumper year for graduate students. If I remember correctly, including the accelerator students, there were 13 of us starting at the same time. Adding in the students from the year below who have managed to complete things a little earlier and it meant that Wednesday was also a bumper day for graduations. At Manchester, there are ceremonies throughout two weeks which are generally split into subjects (especially if the subjects are large enough to fill the hall), so our graduation ceremony was only for the physics department. During this part of the ceremony I was reminded of how much outreach work was still required in my subject area; the students graduating at the ceremony were predominantly male and white. But, at least the post-grads are not a bad bunch! 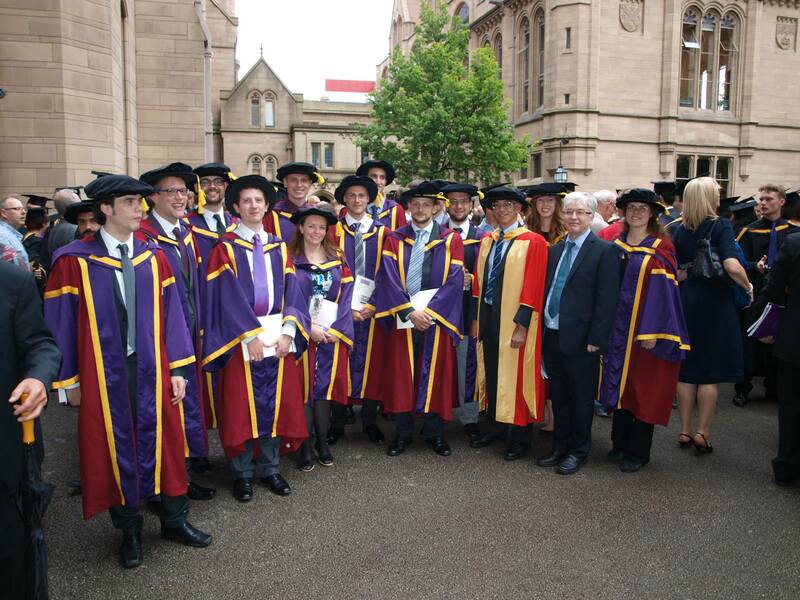 PhD graduates in Physics, University of Manchester, 2014. Photo credit E.H.Maclean. The whole week was a time for celebration for my family as only the day before my older sister graduated from the University of Warwick with a PhD in Plant Sciences! Having the same first initial, we’d spent all of our lives getting confused by post addressed to Miss C. Nellist, but with us both becoming Dr Nellist, nothing changes – at least we’re in different fields!